Viewing Sargent's El Jaleo is much like cooking a sauce: one mixes the ingredients, tastes, adds more salt, then mixes again... except that some time during the mixing process you notice that you can't stop eating the sauce, because you want more of every ingredient it has to offer. In El Jaleo, these ingredients are the composition, use of space, color and shadow. Sargent sought to translate the soulful dynamics of Flamenco onto the canvas. Although an ardent lover of Flamenco, Sargent also had the art world in mind when he painted El Jaleo. Love of the exotic, particularly Spanish culture, was in vogue in Parisian art circles at the time. The opposition and asymmetry of the painting match that of Flamenco dancing. The dancer is off to the center right, which gives the effect of movement. The performers do not distract from her dramatic dancing, but add to the emotional effect, particularly the man in the center who throws his head back in a howl. The performers' clapping on the sides gives the painting a closed-in feel for what could have otherwise become an unwieldy, disconnected composition. It also continues the arm movements of the dancer. The guitars on the left-hand side of the wall fill up the background space so that it does not appear overly vast. Sargents' use of space in El Jaleo is a faithful interpretation of the Flamenco performance. The horizontal line running closely behind the dancer would be an odd choice if the Flamenco musicians did not sit this way so they could time the music to the dancers' feet without blocking the audience. 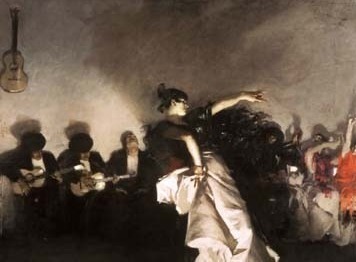 Flamenco stages were also very crowded because of space constraints and all the performers they had to hold; therefore Sargent keeps the stage small in his painting. The empty chair in the background also leaves a void amidst all this closeness, which provides a nice contrast. Since the dancer is also the only one standing, the empty chair suggests her presence. Black, gray and white - with occasional touches of red - is the standard Flamenco performance costume and so the colors of El Jaleo are limited because of Sargents' desire for accuracy. However, he did take licenses with the woman's white satin skirt. Scholars of the time note that no gypsy woman would have been able to afford such clothing. However, the white skirt immediately draws attention to the center of the painting as its folds both illuminate the light and absorb the shadows of the painting. The use of red in the painting provides a contrast to the dark and somber colors. The red is both varied and asymmetrical, much like the rest of the painting: the two womens' shawls on the far right are of different colors, the use of red on the left side is sparser but closer to the center. The orange on the chair, although small, stands out more because of the empty space. The light in this canvas is caused by the flickering candles that lit up theaters at night during the days before electricity. The swirling lights provide a perfect counterpart to the swirling dancer, each playing off the other to create the effect of movement. The white lights on either side of the dancer form a triangle to the white of the skirt. The upper torso of the dancers' body is surrounded by shadow, providing dramatic contrast. The mood of the painting is the same as El Canto Jondo, the musical style of Flamenco that Sargent painted. El Jaleo is raw, gritty, and filled with a sad, mysterious energy as the performers mourn life but also celebrate it. El Jaleo uses the loose, free brush strokes for which Sargent became known. He also left the canvas unvarnished, making the paint more visible, creating an effect of energy throughout the canvas. 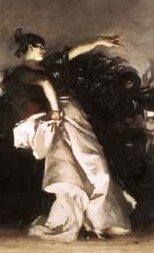 The dancers' foot is so close to the bottom edge of the canvas that she appears as if she could leap out from the painting. The dancers sit closely behind her which gives the feeling of being in an intimate gathering. The stage is on the eye level of the viewer, which gives the effect of feeling like one is in the performance. At the same time, the lighting, the result of flickering candles, makes El Jaleo seem mysterious and almost other-worldly. Thus, the viewer is both close to the painting, but far away from it.